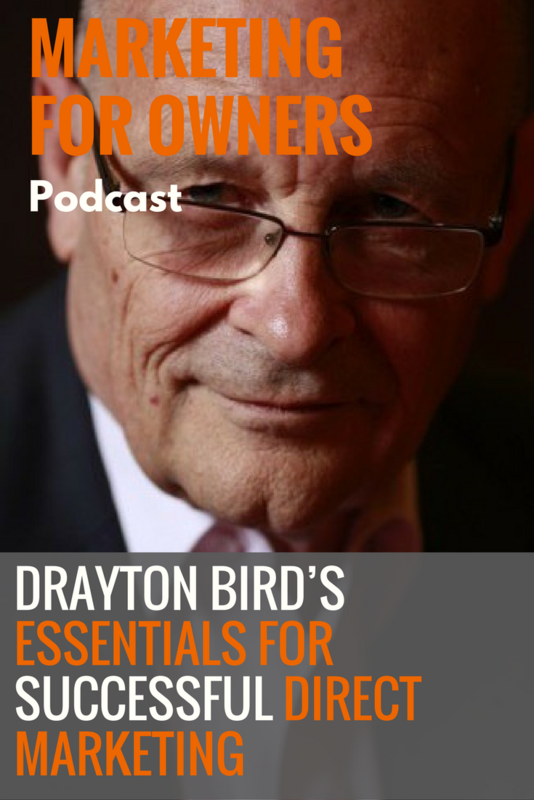 Drayton Bird is a legendary direct marketing expert and writer who was once described as knowing “more about direct marketing than anyone else in the world”. Starting off as a journalist and then becoming a copywriter, by age 27 he was already creative director of a London advertising agency. However, bitten by the mail order bug, he quit his job and repeatedly failed to make his own business ventures work. Amassing a large debt, he spent seven years living under a false name, before realising there was only one thing that he was properly good at. With two partners, he started a direct marketing agency. It wasn’t long before he could start using his real name again, and within three years had made the agency Britain’s biggest. Later sold to David Ogilvy, he joined the board of the Ogilvy Group for eight years. Ever since, he has worked for himself, helping brands with their direct marketing and writing books to help everyone be better. And his book, Commonsense Direct and Digital Marketing, written in 1982, is still immensely useful for marketing better today. It’s isn’t necessary to always be coming up with new ideas. What does work is taking an idea which you know works, and giving it a twist. Many of the lines you’ll see today in the emails you receive and landing pages you visit, are little more than what was used 50 or 100 years ago. Times change, but people don’t. Years ago, long headlines worked better than those of few words, and long copy performed better than shorter copy. Today, blogs which have longer titles and with more words still do better. It’s always been the case. People build on what went on before them. Media changes, but the people using them don’t. The people who are using social media are fundamentally the same people. They have the same loves, hates, and fears. And in regards to shortening attentions spans we hear so much about, Drayton points out that they were never long in the first place. The things you have to do to get people’s attention haven’t changed either. Clicking off of an ad on the computer is no easier than simply glancing away from an advert in a magazine, or walking out of the room when the adverts are on the TV. Are you doing something which nobody else does, or perhaps doing it better than other people? Until you can answer these questions – the things your customers and prospects actually care about – then the chances of you staying business are slim. People are driven by emotion instead of reason, and therefore, we buy from people we like. And you can’t just create a market for yourself. However, you can realise a market which you didn’t know was there. It should be the case that you spend most of your day thinking about your customers, and working out what they actually want. If something is going out directly to a person or it involves them responding directly to you, it is called direct marketing. That can be sending them something in the post, an email, or posting on social media. And it is essential to measure your direct marketing, otherwise, you’re just guessing. When you guess, you risk going broke, and when you’re not measuring, you’re not able to manage it. Yet, in this digital era, it is easier than ever to know whether something is or is not working. It is important to know how well you are spending your money, and by knowing what he gets for his money is how Drayton has stayed in business for so long. The reality is that most people don’t measure, and even when they do, they’re measuring the wrong things. Rather than measuring click-through rates, it is far more telling to actually find out how many you sold and whether you made money or lost it. Knowing that means you know what you can improve, and what you can stop doing. No matter your size or market, you can have a brand. You can build a reputation as the best, and then be able to attract a large queue outside your doors which go down the street. Even two pubs on the same street will have competing brands. How can you position yourself against everyone else? Are you friendlier, or are you more formal than the competition? Knowing what your character is like means you can develop your brand. A strong brand is simply defined as being the one with the most customers. When you have a strong brand, people are prepared to pay a little more, to keep buying from you, and will even forgive the odd mistake. There needs to be a conversation between you and the person you’re selling to. They can then become your friend because remember, people are driven by their emotions. Whether you’re going to do the direct marketing yourself, or are going to hire someone to do it for you, you still have to know about direct marketing. That’s how you can truly what works and what doesn’t. Reading books is a great way of learning, and it is something people don’t do enough. You have to know more than the person next to you, otherwise, you’re the one who is at a disadvantage. Reading is what gives you a broad knowledge of many topics. Drayton says that unless you’ve read Scientific Advertising by Claude Hopkins, which happens to be the shortest book on the topic as well as one of the oldest, then you can’t hope to succeed. A problem which many marketers and other people in business have is not knowing enough about the different weapons they have at their disposal. There are 12 different things to know about to actually understand marketing in full, and it isn’t good enough to know only about one of them. At the end of the day, they all work in the same way. They get hold of a prospect, convert them into a customer, and then keep them as a customer. So if you don’t understand all the different ways you could achieve that, and rely on just email or social media to do it, then you’re not only in trouble, but you’re also weak. When you visit the Drayton Bird Associates website, you can find out more about what he does, read his insightful blog posts, and sign up to receive his email newsletter. When you sign up, you’ll receive 51 helpful marketing ideas from the man himself, as well as a free copy of Claude Hopkins’ Scientific Advertising. You can also email him directly as drayton@draytonbird.com to ask him any question or to receive more information about his Last Hurrah in Bristol.